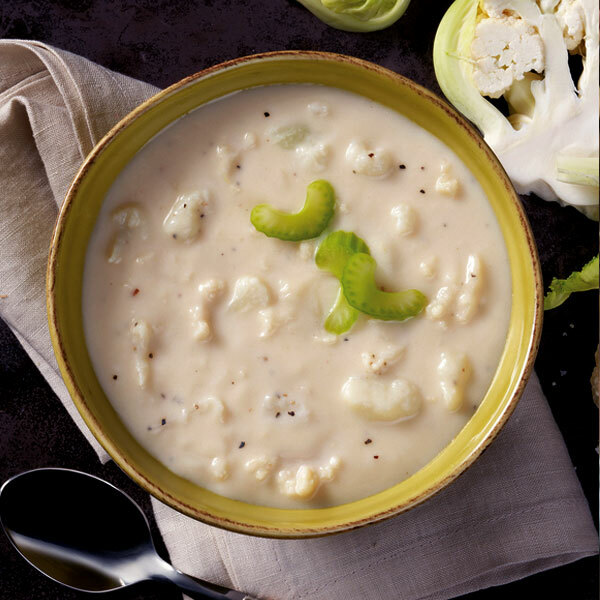 Tender cauliflower florets and sautéed onions in rich blend of sharp cheddar cheese, handcrafted vegetable stock and fresh cream, finished with lemon juice and sea salt. Cauliflower, Water, Vegetable Stock (water, onions, cabbage, celery, mushrooms, carrots, turnips, black peppercorns, mustard seed, dill weed, thyme, bay leaves, marjoram), Cheddar Cheese (milk, cheese cultures, salt, enzymes), Heavy Cream, Onions, Butter (cream, salt), Corn Starch, Rice Flour, Sea Salt, Lemon Juice, Black Pepper, Garlic. Contains Contains Milk.